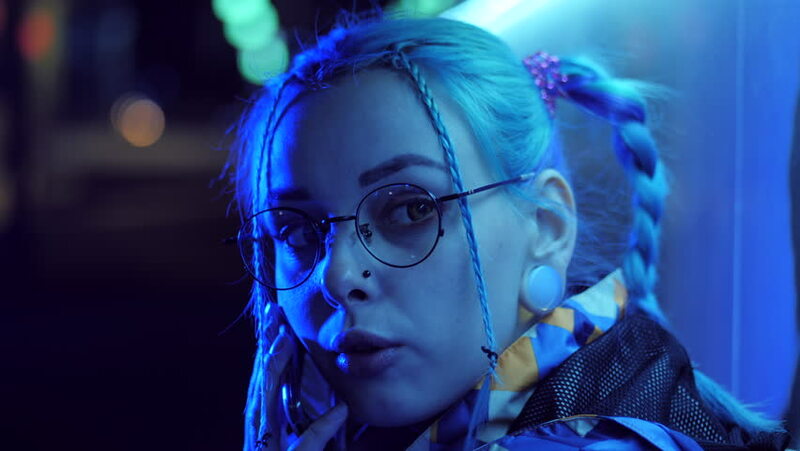 4k00:15Attractive pretty girl with unusual hairstyle near glowing neon lights of the city at night talking with smartphone. Dyed blue hair in braids. Happy hipster teenager using mobile. hd00:11Zrenjanin,Serbia - July 25 2014: soundlovers festival music stage,at the concert stage,dj and concert crowd fans dancing music festival on July 25 2014 in Zrenjanin, Serbia. hd00:14UNITED STATES : A man lays on the floor after slipping from a ledge and later slips on crayons. hd00:15Street punk or hipster girl enjoying empty old European park. Portrait of teen girl with blue dyed hair,piercing in nose,violet lenses and unusual hairstyle dancing.Carefree concept. Slow motion. hd00:09Street punk or hipster girl with blue dyed hair. Woman with piercing in nose, violet lenses, ears tunnels and unusual hairstyle having fun. Carefree concept. Slow motion.